BUCKLEBEAR comes in many shapes and sizes! 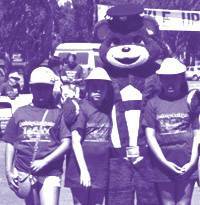 Life-Sized BUCKLEBEAR is used in community programs. 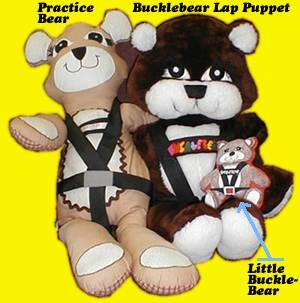 The BUCKLEBEAR Lap Puppet is easily presented to audiences of any size and comes with scripts and audio tapes. Practice Bear supplements curricula and classroom activities. 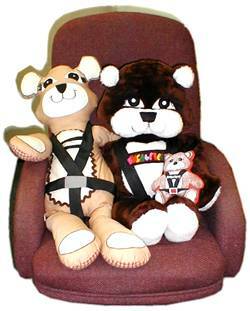 Baby BUCKLEBEAR makes a meaningful give-away bringing a message to young children. Created in 1982, Bucklebear was invited to add a friendly, non-threatening, child-like component to a study developed by Dr. Albert Chang, M.D., MPH and his team at UCLA School of Public Health, through a grant from NHTSA. This study discovered that preschool children can be motivated to take some responsibility for their own passenger safety, and BUCKLEBEAR quickly became a beloved image. After the study, a grant to Dr. Chang from AAP allowed him to purchase 15 BUCKLEBEAR kits which were distributed to resource centers in California. Then, the Bank of America PACE committee sponsored BUCKLEBEAR kits to the LAACPSA, now SafetyBeltSafeUSA, and BUCKLEBEAR was on his way. The bear never looked back and one creative thing led to another...until today, Weiner/Seaman Productions holds over 60 intellectual properties plus U.S. trademarks on child safety materials for BUCKLEBEAR and friends. 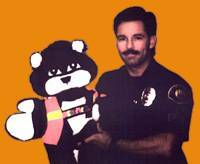 Used by educator/advocates, health and safety agencies, police, EMS, courts, civic organizations, 4-H, Extension Services, individual volunteers, and more, BUCKLEBEAR continues to educate children, parent/caregivers and families. Expanding from passenger safety, BUCKLEBEAR now has materials addressing pedestrian, cycling and environmental issues. The City of Glendale, California, in cooperation with the Mayor, the City Council, school system, librarians, and the Police Department implemented a BUCKLEBEAR passenger safety program the result of which brought NHTSA honors to the Glendale Police Department. 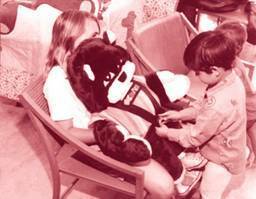 Many states began supplying BUCKLEBEAR materials to innovative volunteers. 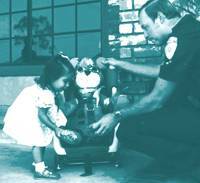 Connecticut's Office of State Police recruited women's clubs, parents and seniors in every township to create the components offered in the BUCKLEBEAR teaching kit and then presented BUCKLEBEAR to preschools. This program was long lasting and effective. The Dept. of Transportation in Missouri provided schools, statewide, with 1700 BUCKLEBEAR audiovisual kits and 200,000 customized Good Passenger Books. A pilot program by the United States Marine Corps showed a 12.4-percent increase in seat belt use in their three-week test and a 20-percent increase in their six-week test. BUCKLEBEAR materials have been approved for implementation at all USMC locations. On behalf of the 27 Orange County Head Start preschool programs in the Central Florida area, I would like to applaud your dedicated efforts in providing BUCKLEBEAR buckle up safety activities for the 1,356 Head Start preschool children enrolled in Orange County. As we prepare to enter the third year of our Florida Department of Transportation grant project partnership targeting Head Start children and parents, we recognize BUCKLEBEAR's unique appeal to our young audience of preschoolers and their teachers. For the past two years, our agency has provided a Children in Traffic workshop to display the variety of preschool safety materials available. BUCKLEBEAR Gets Ready To Go curriculum kit was one of the most requested repeat items when I spoke last month at the in-service teacher training. The Head Start teachers remarked that this curriculum kit was easily implemented into their Head Start classroom learning objectives. Again, thank you for your dedication in educating young passengers and their parents on the best way to stay safe on our busy roadways. Our Headstart curriculum is HIGH SCOPE. This curriculum works very well with ours. My teachers will be able to utilize the materials during Circle Time, Story Time, Outside Play. The activities themselves will be put into the work areas for children to do during their Work Time. The High Scope Curriculum is based on skills that are called Key Experiences. The BUCKLEBEAR activities utilize several of these skills. Some of them are: Music and Movement, Language, Numbers, Classification, Creative Representation and Social/Emotional. Since the teachers assess the children using these tools, the BUCKLEBEAR curriculum will be a big help in evaluating whether the skill has been met or not. The parent participation part of it is also an important part of our program. This will be another way we can get our parents involved. Bucklebear thanks all his loyal friends for their support in the past, and looks forward to once again serving the safety needs of kids and families everywhere. Please note that this entire Website (bucklebear.com), and all text and images therein, are copyright ©1982-2006 by Weiner-Seaman Productions. All rights reserved. For permission to use BUCKLEBEAR® materials for publicity or promotional purposes, please email us at bbmail@bucklebear.com.